A relatively quiet week for spot silver prices which closed at virtually the same price as for the opening on Monday, and traded throughout in a very narrow range. Friday’s candle was typical ending the day marginally lower and following two days of slightly higher prices. 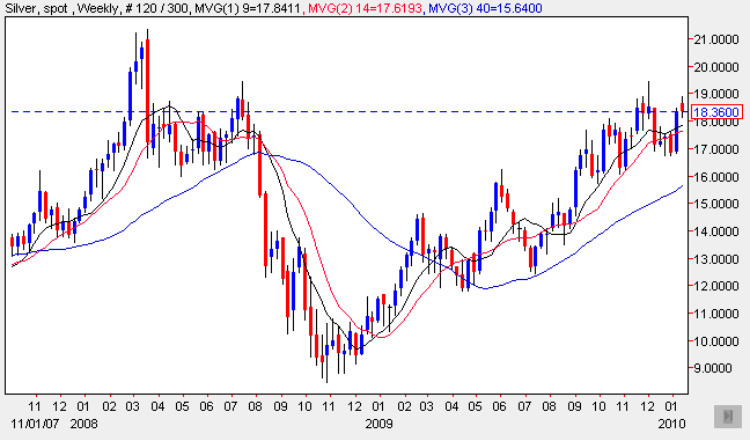 From a technical perspective it is interesting to note however that throughout the week the low of each day found good support from the 9 day moving average suggesting that we could see a continuation of the recent upwards rally in silver prices in due course, and indeed this effect has been seen in this morning’s early trading with silver prices once again supported by this indicator. For the longer term the key price point remains the $19.30 price level and should this be breached with clear water below then we can assume that spot silver prices will continue to move higher as we move towards our $20 per ounce initial target.